This is one of the first "real" things i started working on. It took me about 5 yrs to make it, being that i stopped working on it for about 4...but i was really excited to finish it...and then i gave it to an amazing friend. I know your friend will love it! 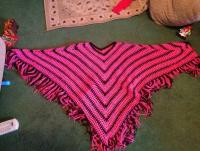 I'm sure your amazing friend loved this amazing poncho!!! It is gorgeous! I bet your friend is still !!! Wonderful! I'm sure your friend will love it! This REALLY nice! Your friend is very lucky! The lucky friend is ME!! I absolutely my poncho. The picture doesn't do it justice! Im so glad you love it! Its too pretty and needed to be worn by someone...lol. Love it! Your friend is so lucky! Do you have the Pattern to the Poncho?????? I love it also and I see your friend does too. I also would like to know where to get the pattern.